A review of 2018 at the JAM Fund. JAM Fund is happy to announce the recipients of this year's JAM Fund Grant! Scott Smith is ready to spread his wings and leave the nest. 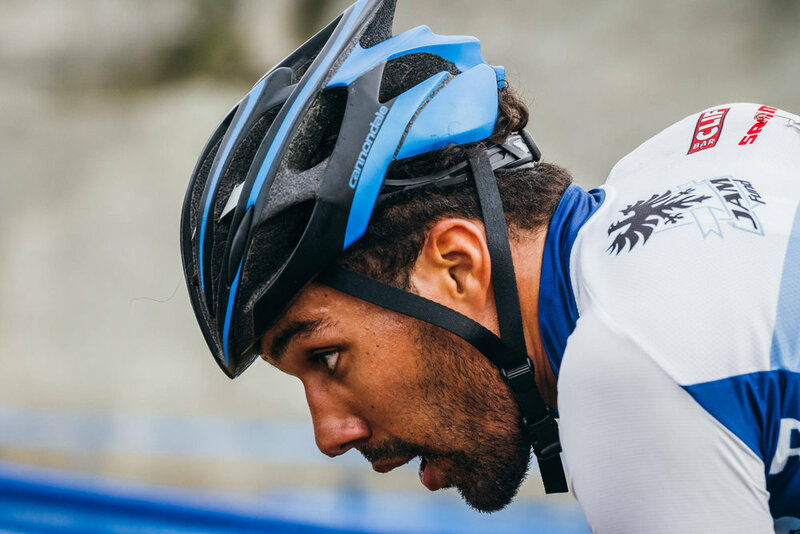 He joins an impressive list of other JAM Fund elites who graduated from the cyclocross development program to move onto the pro ranks including Stephen Hyde (Cannondale), Ellen Noble (Trek), Anthony Clark (Squid) and Jeremy Durrin (Neon Velo). Smith has put in an enormous amount of blood, sweat and tears into JAM Fund and the cycling community, which earns him high praise from JAM Coach and Co-founder Alec Donahue. “I’ve grown as a rider and learned the ways of cyclocross riding with Powers, Hyde, Jack, Ellen and Anthony,” Smith said. Smith’s teammate Jack Kisseberth is also graduating from JAM Fund and moving to Garneau Easton Cyclocross alongside Canadian National Champion Michael Van Den Ham. Rhys May is starting her own team and will mentor junior women (more about that coming soon). Smith would be stoked to race for an established team but has already started working on plan B.
Smith grew up riding BMX at his local skatepark in Agawam, Massachusetts. Inspired by what he learned from his JAM Fund mentors, Smith is passionate about giving back to the sport. He wants to provide kids an opportunity that can change their lives and keep them out of trouble. Smith started out with JAM fund in 2013 as a ragtag Cat 3 rider. That first year, he got a few team jerseys and a Rapha Focus bike frame that he built up himself. Jeremy Powers, one of the co-founders and the “J” in JAM Fund, remembers when Smith called wanting to join the program. Smith raced hard his first year with JAM and by the end of the 2013 cross season, he upgraded to Cat 2. 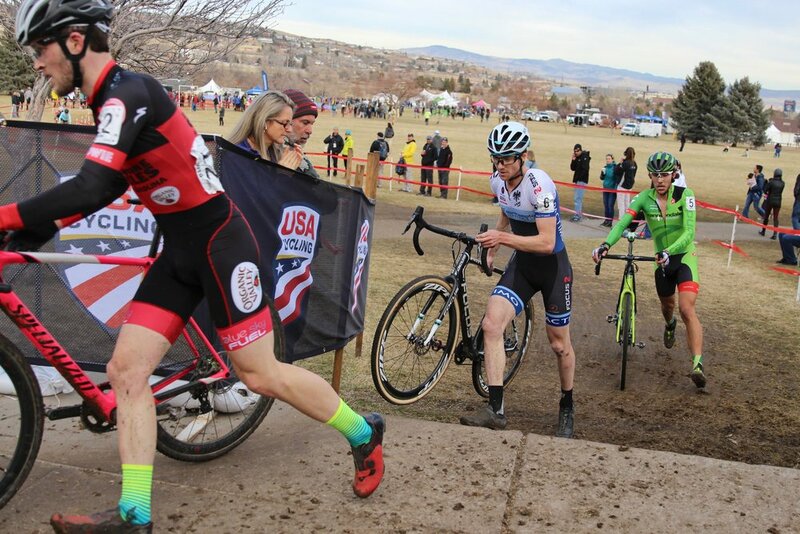 Donahue told Smith if he could find a way to get to Boulder, Colorado he would have a place to stay to race at Cyclocross National Championships. Smith made it to the startline for the U23 race, his first time ever at a national championship. Things got better for Smith in fall 2014. He was promoted to JAM Fund’s elite team and invited to China for his first-ever UCI race. Thinking back over his time with JAM Fund, Smith says that China trip was one of his favorites. Hamming it up for the crowds in China, Smith does a wheelie while crossing the finish line on Sept. 4, 2014. Smith reached another pinnacle in 2014. After the long trip in China for his first-ever UCI race, Smith returned to the states and earned his first UCI point. The following week, Smith pulled off another top ten, getting 8th and more UCI points at NBX Grand Prix in Warwick, Rhode Island. He was in top form heading into Cyclocross Nationals in Austin in January 2015. But then, a stroke of bad luck ruined another one of Smith’s national competitions. The fall 2015 cyclocross season saw some big changes on the JAM/NCC race team. Kisseberth came on board to join Smith on the elite team after Hyde and Clark left for the pro ranks. Smith was still racing in the U23 category, and this year’s goal was to qualify for Worlds. Smith had a strong start in his second full year as an elite racer, getting a top-five at Nittany and winning the U23 at Trek Cup. Then he landed his first UCI podium in third place at Supercross Cup, ahead of quality national-level riders. The following weekend, Smith says he was feeling strong enough to win NBX. Scott Smith hugs former JAM teammate and friend Anthony Clark (Squid) after Clark wins day two and the overall series of the NBX Grand Prix on Dec. 6, 2015. Smith finished fifth overall and was the U23 race leader. Photo by John Kavouris. During a banner year, Smith wins the U23 at Verge Northampton International Cyclocross on Nov. 8, 2015. Photo courtesy of Cycle-Smart. As 2015 was turning out to be Smith’s best cyclocross season, he was determined to have a good race at the 2016 Cyclocross National Championships in Asheville, North Carolina. He refused to settle for another DNF. Smith’s fourth-place national’s finish earned him a spot on Team USA for the U23 World Cup in Hoogerheide and World Championships in Zolder. 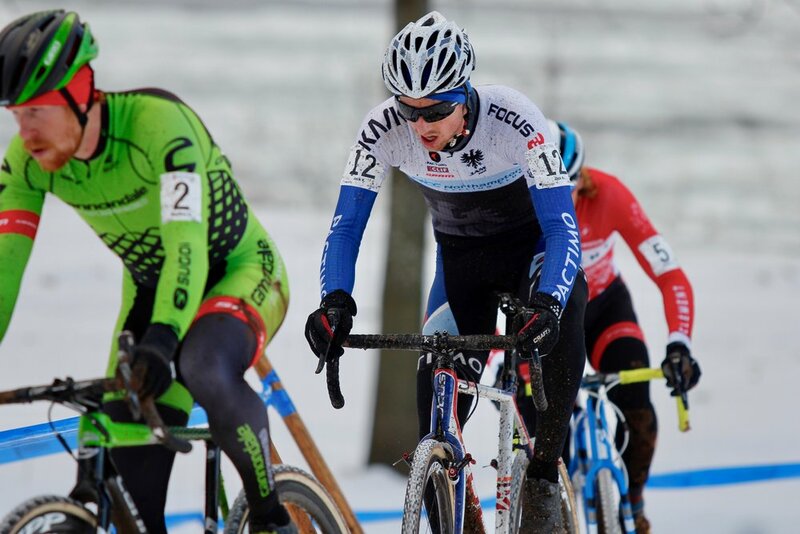 In one of the highlights of his career, Smith, #33, represents Team USA in his first U23 World Championships in Heusden-Zolder, Belgium on Jan. 30, 2016. Photo by Marc Deceuninck. With the exciting start to 2016-- a fourth place at nationals and racing in Europe-- Smith’s year was not without challenges. He spent three weeks in Florida for base training, and shortly after returning home to Massachusetts, he started having knee problems. The pain persisted, and he went back to Belgium anyway. Smith returned home on July 1 and was selected to race at the mid-September World Cup in Las Vegas, the official opening day of the fall cyclocross season. No doubt, 2016 was Smith’s roughest year on the bike. 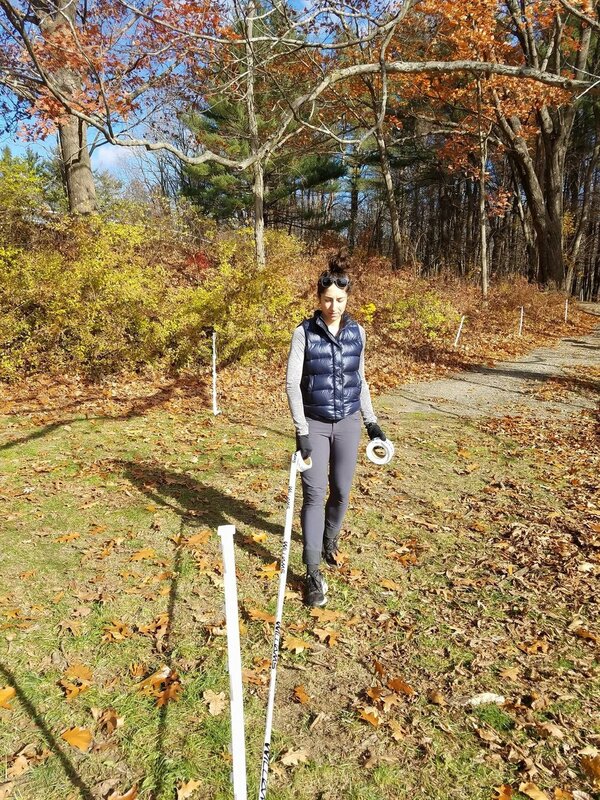 The 2017 Cyclocross National Championships were to be held in JAM Fund’s home turf in nearby Hartford, Connecticut. The race course was less than an hour from Smith’s house. Weeks before the event, Smith and Coach Al talked about Smith skipping it. But Smith is a fighter and determined not to quit even with the cards stacked high against him. Smith finished 13th at Hartford ahead of some big names in cyclocross like Anthony Clark, Danny Summerhill and Travis Livermon. For Kisseberth, Hartford was a real breakout ride. He ended up just off the podium in fourth place. Donahue is proud of both of them and says Smith has always been a true professional. Kisseberth and Smith huddle near the space heater in the JAM Fund tent prior to the elite men's race at Cyclocross National Championships in Hartford, Connecticut on Jan. 8, 2017. Kisseberth finished 4th and Smith 13th. Photo by Vicky Sama. Kisseberth stuck to the front group at Hartford Nationals to finish just off the podium in one of his best career race finishes. JAM alum Stephen Hyde (Cannondale) won his first cross national championship that year. Photo by Vicky Sama. After Hartford Nationals, Smith was determined to fix his knee problem. He went to a physical therapist three days a week for intensive muscle work. She figured out what was wrong. By June, Smith healed and returned to Belgium for a month with other members of the JAM Fund team. The 2017 cyclocross season would be Smith’s last with JAM/NCC. After Gloucester, Smith went to Canada and landed on the podium both days at the Silver Goose. Kisseberth won both days. The following weekend, Smith won the second day at HPCX. Looking calm and cool, Smith won at HPCX, one of the highlights of his final season with JAM/NCC. For podium shot, see cover photo at top. The team took a few weeks off and started to make its way west for the national championships in Reno. On the way, Smith and the JAM Fund crew stopped in Tulsa, Oklahoma for Ruts n’ Guts. The following week, Smith drove with the JAM Fund crew to Dallas and Albuquerque to train in the high desert to prepare for Reno. Joining Smith were Jeremy Powers, Coach Al and Ian Gielar, who rides for JAM/NCC and also works as the pit crew for the elite riders. They stayed with HiFi wheel guru Robbie Douangpanya. Around Christmas time, Smith got sick as did other people in the house. He took antibiotics and went on some hard rides to flush out his system. Still, he feels it impacted his race in Reno. No longer U23, Smith lined up with the elite men this time. Smith jumps over the tricky ditch during Cyclocross National Championships in Reno, Nevada on Jan. 14, 2018. Photo by Vicky Sama. Smith is a skilled rider and known for his ability to jump large obstacles, hop onto picnic tables and balance on skinny curbs. He’s also skilled at producing videos, such as the Jammin’ episodes he put together with teammates Gielar and Kisseberth this past season. For his Dirt League though, Smith is going to be more edgy. Skillz with Scott: Smith helped lead several cross clinics over the years, even teaching the elders how to have fun on one wheel. Photo by Janice Checchio. Smith leaves the JAM Fund with great memories and a lot of lessons learned. Coach Donahue likens the exit of Smith and Kisseberth to the Hotel California. With Smith and Kisseberth gone, there may be room for new elite riders on the team. The JAM/NCC 2017 cyclocross team (left to right): Coach Alec Donahue, Kale Wenczel, Trent Blackburn, Rhys May, Jack Kisseberth, Scott Smith, Natalie Tapias, Chris Norvold, Tim Willis, Daniel Vaughn and Ian Gielar. (Chris Niesen not pictured.) Photo taken in Coach Al's backyard in Southampton, Massachusetts on July 20, 2017. Photo by Vicky Sama. Story by JAM Fund Media Coordinator Vicky Sama at jamcycling@gmail.com. Four weeks before Cyclocross Nationals, Jack Kisseberth and Scott Smith were riding in the JAM Fund van with the organization's co-founder and coach Al Donahue and development team rider and mechanic Ian Gielar. They were on the long road from Western Massachusetts to Reno. The four of them raced in Oklahoma and Texas and went for several training rides in the desert to acclimate for the cyclocross national championships. Smith, Donahue and Gielar headed to New Mexico where they met up with another JAM Fund boss, Four-time Cyclocross National Champion Jeremy Powers and his Aspire Racing team. Meanwhile, Kisseberth flew out to his parent's house in Northern California to spend a full month training at the coast. "For the first time since the summer, I had a long block off of racing to focus on training," Kisseberth said. "I found that hard four- to five-hour rides with intervals were passing by like nothing." Toward the end of that training block, Kisseberth had a special visitor: another member of the JAM Fund family, Defending National Champion and JAM Fund Alum Stephen Hyde (Cannondale/Cyclocrossworld). "Showing Hyde around the roads I had been training on freshened up the training and allowed me to crank out the last few hard rides I had left," Kisseberth said. Jack Kisseberth posted this photo of Stephen Hyde on his Instagram one week before Nationals. The two spent a week training together on the California coast in early January. Kisseberth and Hyde pushed each other hard during interval training that week. Kisseberth said he felt stronger than he had ever been. A year ago at Hartford, Kisseberth finished fourth in his breakthrough national championships with the elite men. His prospects for a podium finish in Reno were promising. "Not only had I put in one of the hardest blocks of training I had ever done, but after an up and down season I went to Reno without the pressure that riders like Hyde and Tobin [Ortenblad] were surely feeling," Kisseberth said. When Kisseberth and the rest of the JAM Fund team got to Rancho San Rafael Regional Park in America's "Biggest Little City," they were as ready as they were going to be. Kisseberth was having a good week leading up to the championship race. He won the 23-39 non-championship event on Tuesday. Smith got fifth. Both were looking strong during practice runs on the off-camber descent on Saturday until the sun went down. At the start of the elite national championships on Sunday, Kisseberth got a front row call up next to the race favorites that included Powers and Hyde. "Jack Kisseberth is a rider that I really like watching," said former cyclocross national champion and race announcer Tim Johnson during the live broadcast. "He puts so much into riding his bike as fast as he can, and man he hangs it out there." Smith started in second row. Both had an excellent start, with Kisseberth in second and Smith in eighth coming out of the holeshot. If that was any indication of what was to come, it was going to be a very good race for the JAM Fund guys. The field stretched into one thin line as the elite men zig zagged through the sandpit. Both Kisseberth and Smith bounced up the Belgian stairs and held their ground in the top ten. The training in Albuquerque in the weeks leading up to Reno was paying off. Three minutes into the first lap, Powers took control at the front and pushed the pace. Gaps were forming. Kisseberth and Smith were in the lead train of about twelve riders. But as they ran up the first big climb, the space between bikes grew larger. Kisseberth was fourth on the descent, showing his fine-tuned skills by posting a front wheelie, flicking his rear wheel out to take a nice tight line through the 45-degree turn at the bottom of the descent. Smith made the turn taking the inside line too, smooth and steady. Traversing the hill on lap one, Scott Smith makes the chase ahead of Jonathan Page. Photo by Vicky Sama. By the time they completed their first lap, there was a clear separation of six leaders that included Powers, Hyde and Kisseberth. 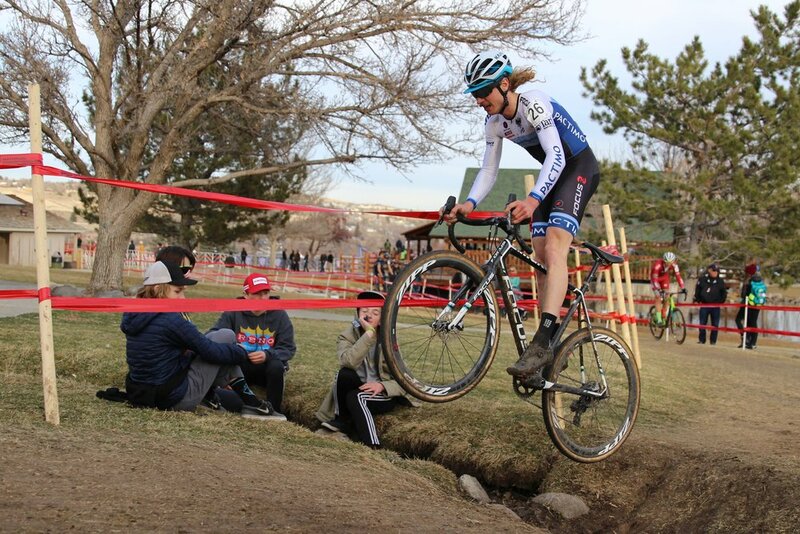 Smith was in a chase with the likes of JAM alum Anthony Clark (Squid), Jamie Driscoll (Donnelly Sports) and Former Cyclocross National Champion Jonathan Page (Assos/Shimano). Jack Kisseberth was in the lead group of five for more than half the race. Here he goes toe-to-toe with Stephen Hyde and Kerry Werner (Kona). Jeremy Powers and Tobin Ortenblad are just ahead, reflected in the shadows at Hyde's feet. Photo by Vicky Sama. Then, lady luck ran out. At the end of the fourth lap as Kisseberth was approaching the run-up, he hit a sharp rock hidden in a puddle. His front tire deflated. It was impossible to ride the off camber with a flat. He was forced to run the entire hill section and lost contact with the other four leaders. "Right before Powers and Hyde put in a dig to split the group with three laps to go, I flatted and lost the opportunity to really test my legs," Kisseberth said. "I still had matches to burn. I knew we had a sizable gap to the rest of the field, so I kept pushing myself to give it all I had." Kisseberth ran the descent and coddled his bike a long way to the pit where Donahue and Gielar were waiting with a fresh bike. The eighth and final lap was painfully close. Coming into the finish, Kisseberth, Curtis White (Cannondale/Cyclocrossworld) and Tobin Ortenblad (Santa Cruz) were only seconds apart. Kisseberth got sixth. "While this wasn't the result I was aiming for, I'm feeling good knowing that I had the fitness to contend at the front of the race," Kisseberth said. "Who knows what would have happened without flatting. I just know I still had some fight left in me." After getting a new bike from the pit, Kisseberth had to make up a lot of ground. He fell back among the chasers including Curtis White who also suffered a flat. The two battled for fifth place with White inching out Kisseberth at the finish. Photo by Vicky Sama. Kisseberth was in great form the entire race looking comfortable on his Focus Mares. Photo by Vicky Sama. Smith finished sixteenth in his last national championships racing for the JAM Fund. "For whatever reason, I just couldn’t get my legs to the result I wanted," Smith said. "I’m not disappointed though. I’ve had my best season to date with multiple podiums and a UCI win. I fixed an on-going knee issue that I thought would end my short lived career. Probably the biggest news this year is that it is my last season with JAM Fund. I’m so thankful for the time I’ve spent on the team and for everything I’ve learned and have been able to give back through the program." Smith isn't sure what his next move will be. But he hints that he'll still be racing. "I don’t have any plans as of right now for next season, but I’m working on it and hope to come in faster than ever," he said. "I’m excited for this new chapter, and can’t wait to see where it goes." At the end of a wickedly hard and eventful nationals race, Scott Smith and Jack Kisseberth are greeted by teammate Kale Wenzcel who raced earlier in the day. Photo by Vicky Sama. Anna Savage rides the high line on the off camber hill during the combined junior women 17-19 and U23 race. She finished tenth among the juniors. Photo by Vicky Sama. 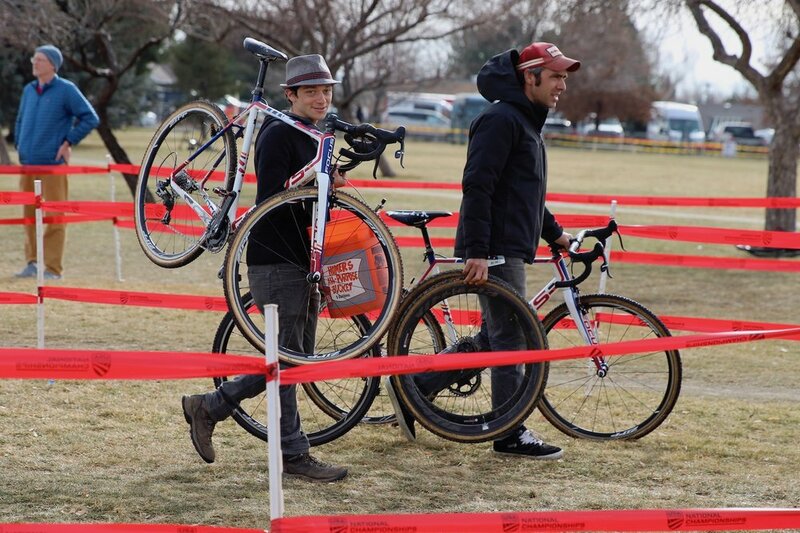 Other members of the JAM/NCC team raced at Cyclocross National Championships. Anna Savage had one of her best nationals yet, getting tenth in the junior women 17-18, which raced in a combined field with the U23 women. "The season definitely ended on a high note," Savage said. "It’s hard to believe that was my last race as a junior. I’m so thankful for everyone who helped me this year, especially my coach Scott Smith and my dad." Savage's father Todd worked the pit for her and fortunately, she didn't have any mechanicals. She enjoyed a clean, consistent race. Ian Gielar and Al Donahue were the pit bosses for the JAM Fund crew. Photo by Vicky Sama. Kale Wenzcel smoothly navigates the sharp turn at the bottom of the descent during the men's U23. Photo by Vicky Sama. Kale Wenzcel and Chris Norvold represented JAM/NCC in the U23 race. It was a blistering fast event and Wenzcel held on for 29th place. Norvold was not having his best day and crashed on the tricky descent onto his left shoulder. Injured and unable to hold the handlebars, he could not finish the race. Chris Norvold flipped over the bike and kissed the dirt on the hard turn that tripped up several riders. He hurt his left shoulder and was forced to quit. Photo by Vicky Sama. The second podium of the week for JAM Fund: Coach Al Donahue finished fourth in the 40-44 national championship race. Coach Donahue raced on Thursday with the master's 40-44, sprinting at the finish to get a fourth place podium spot. Donahue spent the bulk of the week overseeing the JAM Fund team practices and warm ups and also coaching his several athletes competing during the week including defending champ Stephen Hyde. JAM/NCC's elite rider Natalie Tapias skipped out on Reno and for good reason. She had the opportunity of a lifetime, spending three weeks racing on the European pro cyclocross circuit, getting her first overseas race experience. Watch Natalie Tapias notch her first lead lap finish in Belgium at the GP Sven Nys in Baal. Read more about her European race adventures at natalietapias.com. The season is over for most of the JAM Fund team, but Kisseberth has more racing to come. Following his sixth-place nationals finish and top ten overall standing in the USA Pro Cx rankings, Kisseberth was selected to represent Team USA at the World Championships at Valkenburg, Netherlands on February 4. But not all athletes are fully support so he needs help to get there. Please consider giving a boost to Jack in his RallyMe campaign to offset the cost of travel overseas for this great opportunity to race for the U.S.
Help Jack get to Worlds! Watch JAM/NCC's Savage, Wenczel, Norvold, Smith and Kisseberth race in the full replay of Cyclocross National Championships. The JAM Fund has had an action-packed year full of racing, travel at home and abroad, fundraising and volunteering for a variety of events. Several team riders had the chance to race, train and tour around Europe last spring and in summer. We had a great turnout at our annual Grand Fundo and awarded a record number of 33 grants to young cyclists. During the fall race season, at least three team riders earned their first-ever UCI points while others moved up the ranks from the amateur to the elite fields. The JAM Fam grew larger this year adding more riders to the development team. And the love didn't stop there. Four JAM Fund teammates are now engaged. Our founders Jeremy Powers, Coach Al Donahue and Mukunda Feldman are always there making it all happen for JAM Fund. It's been a wonderful year made possible by our generous partners like Focus Bikes, SRAM, Zipp, Kask, Fi'zi:k, Crank Bros, Pactimo, Park Tool, Nuun, Clif, Northampton Cycling Club, Cycle-Smart, WD-40 Bike, BikeReg, Tart Baking Co., Taylor Rental, Family Bike and CEP. And of course we owe gratitude to all our cyclocross fans, riders and their families who show up to cheer us on! We wish you all the best as we approach the New Year, and with that, here's a look at some of our team highlights from 2017.
competed in 22 cyclocross races this season and finished 11 times on the podium. He had four wins including HPCX day one (pictured). He is 8th in the USA Pro Cx ranking and 58th in UCI ranking. He finished 9th at Pan Am Championships against some of the best in the world. At least once in a race this season, he has beaten current U.S. Cyclocross National Champion Stephen Hyde, Tobin Ortenblad and former U.S. Cyclocross National Champion Jeremy Powers. One of Kisseberth's early year highlights was racing at the Hoogerheide World Cup for Team USA. In his final year with the JAM Fund, Scott Smith competed in 22 races this cyclocross season, getting five podium finishes including a win at HPCX on day two. He is 17th in the USA Cycling Pro Cx ranking. Smith has been mentoring and coaching other members of the JAM/NCC team by sharing his super secrets to successful bunny hopping barriers. earned her first UCI point ever at KMC Cross in September. Since then, she continued to rack in UCI points. She competed in 22 races with four top-ten finishes with three podium finishes including a win at Suckerbrook Cross. She is 34th in the USA Cycling Pro Cx ranking. She is in Europe for three weeks for her first run at Belgium cross racing. Her highlight off the bike is her engagement to JAM Fund teammate Tim Willis. says this is one of his best years on and off the bike. He competed in 21 races this year, finishing in the top twenty. That's a significant improvement over last year when he was finishing in the 40s at the UCI races. Highlights of his race season include getting 3rd at Night Weasels Cometh (pictured) and 3rd at Hartford Riverfront Cyclocross. He got engaged to teammate Rhy May just two weeks into cross season. Ah, love. is having a great turnaround this year after a year marred by injury. In his second season with JAM Fund's development team, Gielar earned his first UCI Cx point ever at Supercross Cup in November. He competed in 17 races this year (up from six last year) and got six top-ten finishes including 3rd at Ruts and Guts. To top that, he was the mechanic for JAM Fund's elite team at UCI races. In summer, Gielar traveled and rode his bike in Spain. Photo by Sam Rosenholtz. started with a win at Hartford Riverfront Cyclocross and then got 2nd at Suckerbrook and 3rd at Midnight Rider. He competed in twelve races landing on the podium three times. One of his strongest races was on day one at Northampton International where he finished in the top twenty. He spent three weeks training in Belgium in June with teammates Jack, Scott, Chris Niesen and Coach Al. competed in 22 races, getting six podium finishes include two wins, one at Northampton International and the other at Supercross Cup in the men's Cat 3. After earning the needed upgrade points, Hewitt moved up the ranks and raced his first UCI elite men's race at the NBX Gran Prix in December. Photo by Daghan Perker. represented JAM Fund Development Team in the Category 3 races all season, competing at 22 races and getting three podium finishes. He won Hartford Riverfront Cyclocross in the men's 3/4 and is enthusiastically earning points toward his upgrade. Photo by Angelica Dixon. In his first full season as a Cat 2, Kale Wenczel competed in 18 races, getting two podiums: 2nd at Uncle Sam GP and 3rd at Cheshire Cx. He had respectable finishes at Rochester, Gloucester and NBX against the nation's best riders. raced in 13 cyclocross races this season and finished every one. No DNF's for Tim! He got 2nd at Cheshire Cross, but one of other highlights is his engagement to Natalie Tapias and helping support her as she races in Europe this winter. Photo by Daghan Perker. competes in the junior 17-18 and men's 3/4 categories. He lined up for 17 races this season and finished every one of them. He got four podiums including winning Cider Cross. One of his best performances was at Northampton International where he finished 12th and 11th out of a combined field of more than 80 junior and masters riders. Natalie Tapias prepares for her first-ever race tour in Belgium. The JAM Fund announces its 2017 cyclocross team with the return of its four elite riders Jack Kisseberth, Rhys May, Scott Smith and Natalie Tapias. Kisseberth made a name for himself this past year with his fourth place finish ahead of some of the biggest names in cyclocross at the Cyclocross National Championships in Hartford, Connecticut. He crushed a field of 53 pro riders to win day one of Supercross Cup and raced to podiums in five other pro races. Kisseberth represented the Team USA at the World Cup in Hoogerheide in January. He will certainly be looking for a pro contract in the near future. This summer, Kisseberth and Smith spent several weeks racing in Belgium as part of their pre-cross season training. Smith is the longest team member, racing for JAM for the past four years. May and Tapias are returning to the JAM Fund elite team for a second year. Both have been on the local race circuits this summer and are amped for a strong cross season. JAM Fund's development team includes returning riders Trent Blackburn, Ian Gielar, Chris Niesen and Kale Wenczel. New to the devo squad this year are Mark Hewitt and Tim Willis and junior riders Chris Norvold and Daniel Vaughn. All riders receive training under JAM Fund Coach Alec Donahue, who is arguably one of the best cyclocross coaches in the country. Donahue coaches pro cyclist Ellen Noble, the U23 U.S. National and World Cup Champion. You can read more about the team at jamcycling.org/riders. Pictured above from left to right: Coach Alec Donahue, Kale Wenczel, Trent Blackburn, Rhys May, Jack Kisseberth, Scott Smith, Natalie Tapias, Chris Norvold, Tim Willis, Daniel Vaughn and Ian Gielar. Missing: Chris Niesen. JAM Fund announces 30 grant winners! 8th Annual Grand Fundo is coming soon! Registration is Now Open for the Eighth Annual Grand Fundo! SOUTHAMPTON, MASSACHUSETTS (June 20, 2017) Catch the allstars of cyclocross at the JAM Fund’s eighth annual GRAND FUNDO, the one-day bike ride through the scenic Pioneer Valley of Western Massachusetts. Leading this year’s ride is four-time U.S. Cyclocross National Champion Jeremy Powers and the JAM Fund riders and friends. The ride starts at 9:30 a.m. on Saturday, July 22 at Glendale Ridge Vineyard in Southampton (previously Black Birch Vineyard), located in Powers’ own neighborhood. After the ride, celebrate with a delicious barbecue and beer under the big tent on the vineyard grounds. All registered riders will receive a pint glass with the signature JAM Fund logo to take home as a reminder of the special day. More than 400 cyclists are expected to participate. Because they were so dialed in, this year’s Grand Fundo will follow the same routes as last year, although, you never know what Powers has under his jersey sleeve. He’s been out scouting new roads this summer. When you register, select to ride one of the three distances: 39-mile Mini Fundo, 65-mile Grand Fundo or 85-mile Grand Hundo. As in previous years, all rides have rest stops fully stocked with the JAM Fund’s world famous peanut butter, Fluffernutter, bacon and blueberry sandwiches. Riders can stay refreshed with plenty of drinks from Nuun Hydration. It wouldn’t be a fun Fundo without the stocked-to-the-hilts ice cream truck, and SRAM will supply support vehicles to help those who have mechanicals along the way. Of course, there’s the giant pig roast and raffle where ticket holders can win special prizes including the Focus Mares bike that Jeremy Powers rode during National Championships! All that and more exciting stuff to provide an amazing ride experience! The Grand Fundo is JAM Fund’s biggest fundraiser of the year. All proceeds go to the non-profit’s development program that helps young cyclists achieve their goals and be better ambassadors in the community. The fundraiser allows JAM Fund to teach riders life skills and provides the support needed to send the team to the highest level races such as National and World Championships. But it’s not only about the competition: Traveling introduces the riders to different cultures in a way that they can better understand their own. In addition, the JAM Fund will award grants to more than a dozen young cyclists to help them overcome financial barriers to the sport. The grant recipients will receive cash, equipment or both at the post-ride barbecue. So participation in the Grand Fundo is for a great cause! To register for the GRAND FUNDO, go to https://www.bikereg.com/jam-fund-grand-fundo. JAM Fund is a 501c3 organization created in 2003 by Jeremy Powers, Alec Donahue and Mukunda Feldman, three great friends brought together in their passion for cycling. JAM Fund’s mission is to help motivated, young cyclists to reach their potential on and off the bike, while not being limited by finances. This is reached through close mentoring and involvement in the cycling community. Grants are issued to young cyclists in and around the Pioneer Valley who show the interest, determination and desire to be their best. To learn more, visit www.jamcycling.org. For media: Journalists interested in riding the Fundo should contact Vicky Sama at the number above. Use of attached photos please courtesy Meg McMahon. Ben Jankowski is passionate about food and cycling and wants to combine both in his future. He's a 20-year-old sophomore at UMass studying resource economics and food farming. He manages a student farm, is vice president of the university's cycling club and volunteers at local cycling events to inspire kids to ride. It's no wonder that last year he won a JAM Fund Grant. "The grant means that those of us who want to test ourselves and grow as athletes have the ability to do so," he said. In addition to the grant funding Jankowski received, he built a special relationship with the JAM Fund crew. "It doesn’t get much better than being able to pedal with the rad riders in the JAM fam," he said. "I was able to follow their structure and learn by watching some of the best bike handlers in the nation. I feel myself getting stronger and see improvement in my technical skills. I owe most of that to the JAM fam and to the crew of cyclists out here in the valley. The grant let me meet these groups." Jankowski encourages other young, passionate cyclists to apply for a JAM Fund Grant. "The JAM Grant incorporates cyclists into a team that runs on holistic goals, which is what I love most," he said. "This is a team that trains in the physical sphere, and personal, by developing athletes who are inspiring community builders. The last few weeks, for example, the team volunteered at the NCC Kids CX events, which aims to show kiddos how fun cyclocross and riding your bike is. Groups like JAM are opening doors into the cycling world. Ride your bike. Have fun. Get sendy. Get stronger. Become part of the family. It’s pretty sweet!" JAM Fund Grants are made possible by generous donations and from rider participation in the non-profit's biggest fundraiser, the Grand Fundo. All proceeds from the Fundo bike ride go toward supporting the JAM Fund cycling and grant programs. JAM Fund is accepting grant applications now. The deadline is June 10. "The first grant I got motivated me to race cyclocross. I got a focus frame, helmet, clothes and money that allowed me to start racing. The second one helped me learn to race more independently and get even more involved. The JAM Fund really made my cyclocross seasons great." "The JAM Fund Grant means an awesome team that will support you through the whole season! The grant helped me get equipment to make my racing possible. The team will help you with tips at races and if you have a last minute bike problem, they will help you fix it so you can still race." "After I got the grant, I met more JAM riders and they were so supportive. The whole team is like one big family, and when I received the grant they made me feel like a part of the family. I will definitely apply for another JAM Fund Grant because last cross season was one of the best I ever had." "The grant gave me support in getting to where I want to be in cycling. It means another year of being pushed to be better by everyone on JAM. I'm not sure how I would have made it through the season without my grant last year. I used it to pay for races and my expensive UCI license." "I felt rewarded that all my hard work payed off by getting the JAM Fund Grant, which changed my cyclocross season in many ways. It made me train a lot harder in the offseason. I felt very happy and proud that I got the grant." Mark your calendar! Our eighth annual JAM Fund Grand Fundo is Saturday, July 22! Our one-day bike ride through the scenic Pioneer Valley is a fundraiser for our cycling development program. Saturday's ride starts and finishes at the Black Birch Vineyards in Southampton, Massachusetts. Five hundred cyclists are expected to participate. There are three ride distances of 39, 65 or 85 miles, so riders have the option of a route that fits their ability. Four-time National Cyclocross Champion Jeremy Powers, who lives in Southampton, will once again lead the ride and pedal alongside cyclists of all different levels. Powers is the co-founder of JAM Fund along with his two close friends Alec Donahue and Mukunda Feldman. The rides are fully supported with rest stops loaded with food, hydration drinks, aid stations, our famous ice cream truck, and SRAM professional support vehicles. The route has spectacular views and the long loop should take advanced riders about four hours. Immediately after the Fundo, riders are treated to a barbecue, pig roast and raffle where participants can win incredible prizes. All registered riders will also get swag to remember the special day, and most importantly, your participation helps support JAM Fund. Above photo by Meg McMahon. 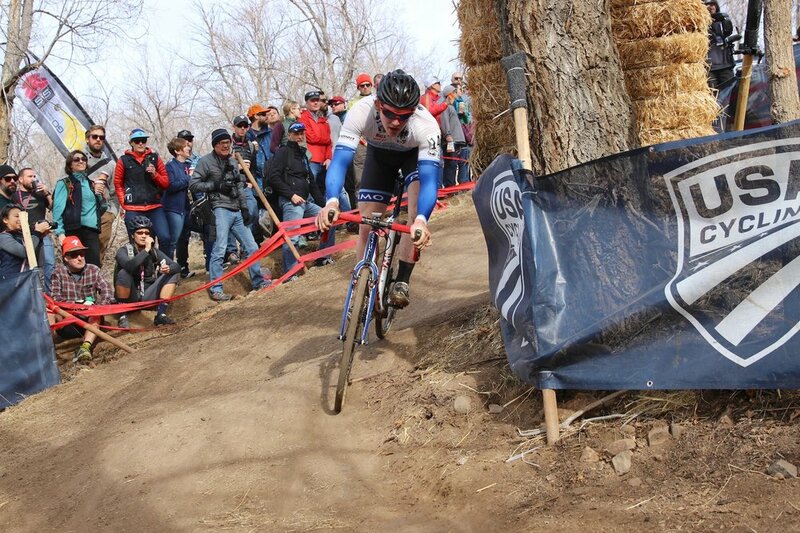 Watch Jack Kisseberth rock the house at Cyclocross National Championships! Jack Kisseberth had the race of a lifetime at Cyclocross National Championships in Hartford, Connecticut. During the start of the elite men's race on Sunday, Kisseberth was in an ideal top-ten position with the big names in cyclocross, all struggling to cross the slippery Break Bonker Hill. While eventual race winner, JAM Alum Stephen Hyde (Cannondale/Cyclocrossworld) got a gap with a fast run up, Kisseberth pursued with a ferocious chase and was riding in second position behind Hyde by the end of the the third lap. "I was going 150%," Kisseberth said. "The next lap I dropped to 90%. It was hard." Kisseberth kept an amazingly fast pace and finished just off the podium in fourth place. He crossed the line 56 seconds behind Hyde. With six laps to go, Jack Kisseberth was on the wheel of last year's U23 national champion Tobin Ortenblad (Santa Cruz Racing). Kisseberth passed Ortenblad and held him off to finish eight seconds ahead in fourth place. Photo by Vicky Sama. Scott Smith had a rough start, but his strong technical skills helped him glide over the frozen ruts and fly down the icy descents. Smith passed more than half the field and finished in 13th place. "It was hard to pass on the course with all the ruts and bumps," Smith said. "I felt good." "Scott, Jack and Hyde practice riding really technical stuff a lot," said Coach Alec Donahue. "That's why a course like this didn't faze them." Scott Smith rides the extreme descent leading into the finish line, making it look easy. Photo by Vicky Sama. JAM alums Jeremy Durrin finished eleventh and Anthony Clark got 25th. The cycling press and race announcers said Kisseberth was the story of the day. Watch the replay of the U.S. Cyclocross National Championships. Four JAM/NCC junior riders made their debut in Cyclocross National Championships this weekend at Riverside Park in Hartford, Connecticut. Jaden Wise, 14, lined up at 9 o'clock in the morning with 62 riders in the junior 13-14 category while temperatures dropped below freezing. He had a strong start, moving up quickly through the pack from his third-row call up position. Things were looking pretty good until he hit traffic at the base of Break Bonker Hill, which was covered in frozen-solid, cement-hard ruts. "I got caught behind a group of riders that had a hard time running the off camber," he said. "I got passed by a lot of people." Wise won ten races this cyclocross season but says National Championships were a new challenge. He finished on the lead lap in 25th place. "It was fun, hard and very different than the other races that I have done," he said. "It was nationals, and there were kids from all over the country." Mira Fowler rides the loops closest to the river during the Cyclocross National Championships in Hartford, Connecticut. Photo by Vicky Sama. Mira Fowler, 14, was also making her debut at nationals and raced in the junior girls 13-14 event. "I really liked the course," she said. "It was my first nationals and I can't wait for more to come." Aiden Mapel "suitcases" his bike over the barriers just as the snow starts to fall. Photo by Vicky Sama. By noon on Saturday, it was dumping snow as Aiden Mapel, 15, lined up to start racing with the junior men 15-16. He was bundled up just enough to keep warm to finish in 58th in a large juniors field. Katie Johnson finished 13th in the junior 15-16 on Saturday. Katie Johnson, 16, raced in white-out conditions in the junior women's 16-17, where she finished 13th. "My favorite part was the ruts," she said. "It really, really pushed me physically and it all came down to the mental game of how hard and clean to ride." Johnson says the most difficult part of the race was the Bonk Breaker Hill, where junior riders traversed the base of the hill rather than climb it as other categories did in previous days. "It was hard to run along the top without slipping and hard to see what was ahead," Johnson said. "Overall, the experience was amazing. This is going to be a race I will talk about for ages." Course conditions were a bit muddier on Friday when Coach Alec Donahue raced with the Master's 40-44. The frozen ruts made the Break Bonker Hill mostly unrideable and that meant a lot of running. Donahue had a decent race finishing in the top ten. On Sunday, JAM/NCC riders will be racing in several events. Jack Kisseberth and Scott Smith will represent the team in the elite men's race at 3:00 p.m. Natalie Tapias will race the women's elite at 1:15 p.m.. Trent Blackburn and Case Butler will be in the U23 race at 11:30 a.m.. Anna Savage will race in the junior 17-18 that goes off at the same time as the women's U23 but will be scored separately. Her race is at 10:00 a.m.. All of Sunday's races will be live-streamed starting at 9:00 a.m. on USA Cycling Youtube or at Cyclocross Magazine. Time for Cyclocross National Championships! JAM/NCC is revved up to race at the Cyclocross National Championships in Hartford, Connecticut this week. Leading the charge for the elite men will be Jack Kisseberth and Scott Smith, who will race on Sunday, January 8. Kisseberth is coming off a strong season, winning the first day at Supercross Cup in November and landing on the podium both days of the NBX Gran Prix of Cross. 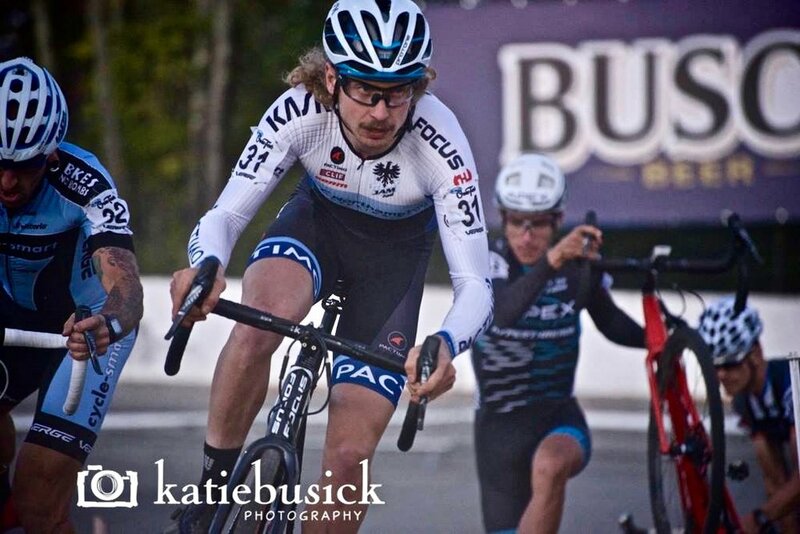 Kisseberth will be looking to best his impressive performance at last year's Cyclocross Nationals in Asheville, North Carolina where he finished in eleventh place. Jack Kisseberth on his last lap behind JAM Fund alum Anthony Clark (Squid Bikes) at the 2016 Cyclocross National Championships in Asheville, North Carolina. Kisseberth finished just outside of the top ten. Photo by Vicky Sama. Smith has been training this winter in the snow and has the technical skills needed for the Hartford course, which has several steep off-camber sections that could be an even bigger challenge depending on weather conditions. Smith got fourth at last year's Cyclocross Nationals in the U23. This time, he'll be racing in the elite field. Natalie Tapias will represent JAM/NCC in the elite women's race on Sunday. Tapias joined JAM Fund in 2016 and competed in 22 races, on the start line nearly every weekend during the cross season. She left her corporate job last summer to dedicate her time to racing cross with JAM Fund and shows consistent strength and improvement that will surely pay off this week. Rhys May focuses on the course ahead at the NBX Gran Prix of Cyclocross on Dec. 3. Rhys May is a crusher with one gear and will be racing single speed nationals on Saturday. She won the single speed race at the Ice Weasels Cometh last month. If that's any indicator, we could see May on the podium again this week. JAM/NCC will have a solid presence in Sunday's U23 race with development team riders Trent Blackburn and Case Butler. Blackburn has been on the podium a handful of times this season in the local races and finished in the top-fifteen in the bigger pro events including 14th at the Northampton International. He is a strong technical rider who jumps most obstacles and was the bunny hop champion at Cyclocross of White Park. He won the Cat 2/3 at KMC Cross Festival, was 5th in the U23 at the Gran Prix of Gloucester and in his last race of 2016, he finished third among the U23 at NBX Gran Prix of Cross. We can expect Butler to be in close range of Blackburn on Sunday. The two have raced consistently all season, nearly neck-and-neck in their race finishes. Butler has several top-twenty pro race finishes in his resume and has been close to the podium in the U23 field. Like Blackburn, Butler is focused and determined, which could result in a great finish at nationals. Junior riders Anna Savage, Katie Johnson and Jaden Wise will be racing in the JAM/NCC kit this week as well. All three have had an excellent cross season. Wise, who is 14, is practically unbeatable with ten victories, winning nearly every junior race he's entered this season. He scored back-to-back wins on both days of the KMC Cross Festival, Gran Prix of Gloucester, Northampton International and NBX Gran Prix of Cross. Savage, 17, is a dedicated cross racer. She finished 26 races in the 2016 season and more than 130 cross races over the past six years. Most impressively, she has only DNF'd once in all those years. Savage won a handful of local races last year and finished second in the Verge New England Cyclocross Series. Katie Johnson races to third place at the Ice Weasels Cometh on Dec. 10. Photo by Katie Busick. Katie Johnson, 16, is in her first full cyclocross race season and already graced the podium several times. She finished first and second in the junior women 15-16 at the KMC Cross Festival in October. She also races in Cat 4. We expect to see some strong results from all our juniors. We'll also be watching Kale Wenczel (Joe's Garage) and Aiden Mapel (JAM/NCC) who received JAM Fund grants last summer and have been racing and training closely with the JAM Fund crew. Wenczel, 19, won Cat 3 races early in the 2016 cross season, including big victories at KMC Cross Festival and Gran Prix of Gloucester. He moved up to the pro fields mid-season and we can expect to see him race his heart out in the U23 on Sunday. And talking about heart, we are excited to support Aiden Mapel, 15, who will race in his first National Championships, taking to the start line with the junior men 15-18. Coach Al Donahue rode the Hartford course over the weekend with several of the JAM Fund crew and says it requires total focus. He finished 6th at last year's Cyclocross Nationals and will be racing again this year in the Master's 40-44. We'll also be cheering on JAM Fund Co-founder Jeremy Powers (Aspire Racing) and JAM Fund alums Ellen Noble (Aspire Racing), Stephen Hyde (Cannondale/Cyclocrossworld), Anthony Clark (Squid Bikes) and Jeremy Durrin (NeonVelo). Sunday's elite races will be streamed live at USACycling.org and we'll bring you results and stories of our JAM Fund crew throughout the week. See you in Hartford! 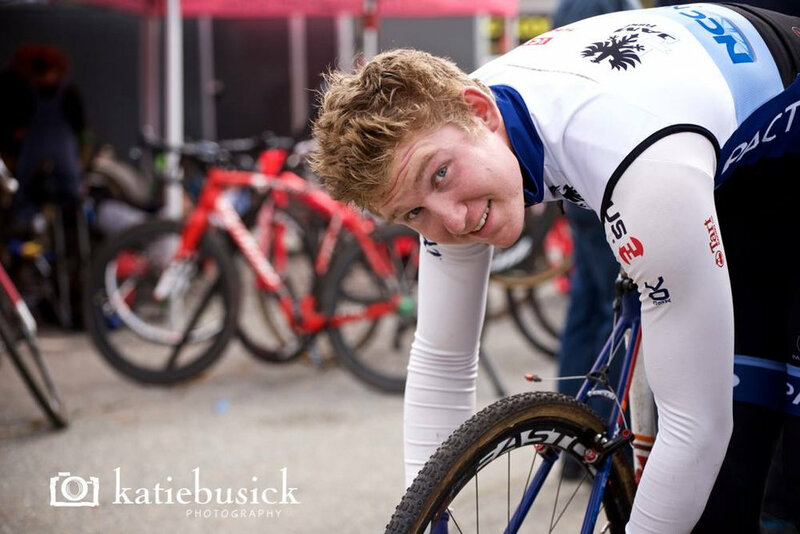 Jack Kisseberth (JAM/NCC) graced the podium for yet another weekend in elite cyclocross. He finished second place on day two of the NBX Gran Prix of Cyclocross in Warwick, Rhode Island. Kisseberth led an aggressive race with series leader Curtis White (Cannondale/Cyclocross World) on his wheel for much of the race. "I felt like I rode better but Curtis was just a little stronger," Kisseberth said. "He opened a small gap on the sand with about two laps to go. I was able to keep it around 10 seconds, but could not close it. " White said it took a full lap to get away from Kisseberth. "It was a long, concerted effort," White said. "There were a few spots I felt he was slipping a little bit but a lot of places he was strong. He was really there the whole time." The previous day, Kisseberth finished third in a tight sprint with former JAM Fund brethren Jeremy Durrin (Neon Velo). Kisseberth suffered a flat, pitted and caught back up to Durrin but didn't have the gas for the last kick. "I'm fairly happy with the races," Kisseberth said. "I got beat by Durrin in a sprint for second on Saturday, and losing a sprint is always frustrating." Jack Kisseberth talks to Dirtwire TV about his close finish with Jeremy Durrin at the Dec. 3 Gran Prix of Cyclocross. Kisseberth is in good form. He's been on the podium in six UCI races over the past month including second and third places at NBX this weekend. In addition, he finished second at HPCX and second at Northampton International. He out-sprinted White two weeks ago to win the Supercross Cup-- his first UCI victory-- and the next day he finished third. "I'm happy that I am consistently getting on the podium and that I can see how I am getting closer to someone like Curtis," Kisseberth said. The NBX Gran Prix was the grand finale in the Vittoria Northeast Cyclocross Series (NECXS). Kisseberth ended up second place in the series behind White. Jack Kisseberth led the men's elite field for several laps during the NBX Gran Prix of Cyclocross on Dec. 4, eventually getting second place. Watch Sunday's race highlights above. 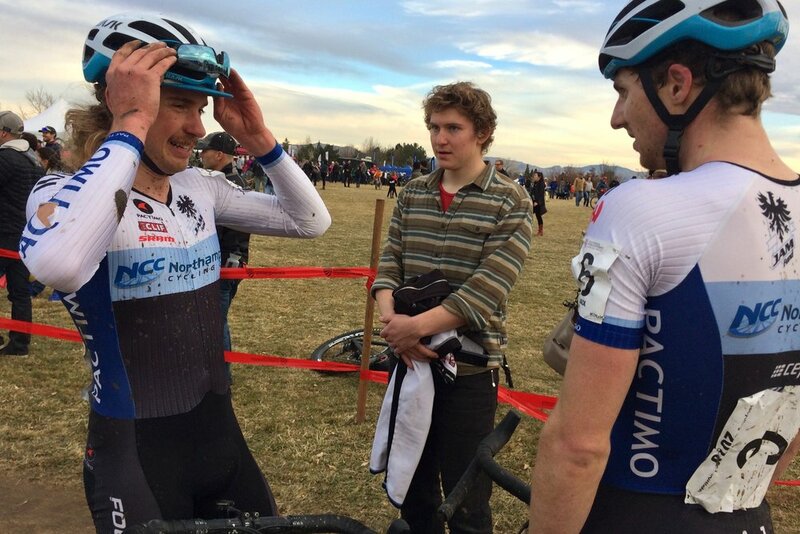 Trent Blackburn (right) was the third U23 finisher at the Dec. 3 Gran Prix of Cyclocross. He finished 13th among all riders in the elite category. Kisseberth wasn't the only JAM/NCC rider on the podium at NBXGP. Trent Blackburn was the third-place finisher among the U23 on Saturday and Jaden Wise won the junior men 9-14 both days, giving him the overall series championship among the youngest of guns. It was the 14-year-old's tenth victory of the season. 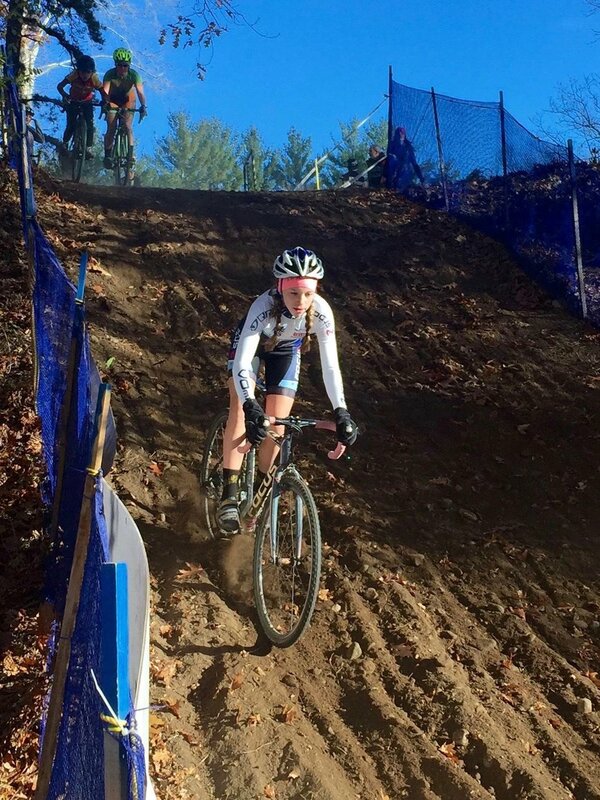 Jaden Wise (JAM/NCC) got the lead at the start of the junior 9-14 race and held it to the finish line, winning the race both days at NBX Gran Prix of Cyclocross and the Vittoria Northeast Cyclocross series. Photo by Aliicia Crowell Furrer. Also in the men's elite race with Kisseberth and Blackburn were Coach Alec Donahue who finished 9th on Saturday and 11th on Sunday and Case Butler who finished inside the top 20 on Sunday, getting in 18th place after a 25th place finish on Saturday. Natalie Tapias and Rhys May raced in the women's elite events both days. Anna Savage raced in the Cat 3, completing her 24th race of the season, and having finished every one. Aiden Mapel raced in the Cat 4/5 with more than 120 riders at the start line. Above: JAM/NCC racers shoulder their bikes on the long sandy beach run at Goddard Memorial Park in Warwick, Rhode Island. Three photos by Katie Busick Photography. Talented cycling photographer Meg McMahon captured the finishing sprint between Jack Kisseberth and Jeremy Durrin on day one of the Gran Prix of Cyclocross. Above photo by Katie Busick. Above, Natalie Tapias applies the course tape; Jack Kisseberth grills sausages at the food tent; Rhys May sells the food and drinks; and Chris Niesen bakes the giant chocolate chip cookies for the race winners. The men's elite podium on Saturday with Jack Kisseberth (JAM/NCC) in second place, Curtis White (Cannondale/CyclocrossWorld) in first and Jeremy Durrin (Neon Velo) in third. Photo courtesy Northampton Cyclocross International. One of the highlights of the weekend for JAM/NCC came on day one. Jack Kisseberth chased the cookie and got really close. After spending a few hours helping out at the food tent, he finished second in the elite men's race behind Curtis White (Cannondale/CyclocrossWorld) in a big field of 81 riders. He nipped out JAM Alum Jeremy Durrin (Neon Velo) by three seconds after spending most of the race in the front chase group with Durrin and Jeremy Powers (Aspire Racing). "Powers did some driving of the pace early, but Curtis attacked with a few laps to go and got a gap," said Kisseberth who finished 13 seconds behind White. Jack Kisseberth talks to Dirtwire TV about his second place finish on day one at the Northampton International Cyclocross. Kisseberth has been having some great race finishes lately. He also finished second in the elite men's race two weeks ago at HPCX. Trent Blackburn had a strong weekend of racing with the elite men, finishing in 14th place on Sunday and in the top 20 on Saturday. Perhaps his improved finish was due to the sausages he ate for breakfast. Or maybe it was following Coach Al Donahue's advice. "I started way harder than I have in a while, per Al's recommendation," Blackburn said. "Once the race settled in, I moved up to the group that was 14 to 20 and led them almost the entire race. I hopped the barriers every lap at full speed. On the last lap, I gutted myself attacking every corner and was still able to out-sprint the few riders left on my wheel. " Trent Blackburn cleanly hopped all the barriers at the Northampton International Cyclocross Race on Saturday. Photo by Uri Halevi. The previous day, the elite men's race was a bit chaotic at the start, and Blackburn was caught behind a pile-up at the very first turn. Despite that, Blackburn rode consistently with each lap at about eight minutes, to finish in 20th place. Teammate Case Butler was close in 22nd. With that, Blackburn and Butler finished 4th and 5th respectively among the U23. Also in the elite race was JAM/NCC's Chris Niesen, who was the 80th rider called to the start line. He made up for it with his eighth and final lap as his fastest and finishing on the lead lap. Not bad for standing many hours baking cookies and setting up the course. Natalie Tapias runs smoothly up the steep climb during the women's elite race on Sunday. Photo by Spoken Shutter Photography. Like Niesen, Natalie Tapias' engine revved up during the race with each lap getting faster and faster. Her fifth and final lap was 42 seconds faster than her first. She finished 20th on Saturday and 23rd on Sunday in a healthy field of elite women. Rhys May also raced on Saturday after a long day baking, but sat out Sunday in order to graciously volunteer at the sausage tent. "I felt like this bowl of chocolate chip dough when I rode my bike today," she said after Saturday's race. "But it was worth it." Rhys May in the kitchen at Tart Baking Co., mixes the cookie dough for the giant chocolate chip cookies awarded to race winners. JAM Fund Coach Al Donahue led the charge of the 35+ race on day one. He rallied to fourth place on Saturday, and on Sunday he finished sixth. Photo by Northampton Cyclocross International. Anna Savage competed in the combined field of more than 50 riders in the women's Cat 3, 45+ and juniors. She finished third among the junior women 15-18 on Saturday. Sunday didn't go as well, but she still finished fourth. "I had a good start but sadly crashed with two laps to go," she said. Savage has participated actively in races this season, with no DNF's, and she has been improving week after week. Anna Savage (right), got 3rd among Cat 3 junior women 15-18 on Saturday. Katie Johnson (right) finished third in the Cat 4 junior women's 15-18 on Sunday. Jaden Wise won the junior boys 9-14 race both days. Jaden Wise came back to the start line after a few well-deserved weeks of rest and crushed the junior boys 9-14 year-olds on both Saturday and Sunday. He won Saturday's two-lap race of 48 riders and was the only one who finished in under 20 minutes. On Sunday, he repeated his victory, beating 40 other riders. Mira Fowler had a good weekend, finishing fourth both days in the junior girls 9-14. Photo by Jeff Fowler. Watch video highlights from Saturday's elite men's and women's races at the 26th Annual Verge Northampton International Cyclocross Race in Northampton, Massachusetts. Videoes produced by Dirtwire TV. JAM/NCC put on a show at the weekend's Gran Prix of Gloucester, the cyclocross classic affectionately known as New England Worlds. Photo by Health Warrior/Garneau.